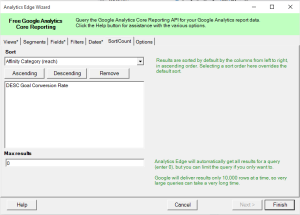 Use this Analytics Edge wizard to select the sort order to use for the query. Additionally, you can restrict the query to download a limited number of rows i.e. the top 10. To sort on multiple columns, select each column in turn and click either Ascending or Descending. Columns will be sorted in the order entered. 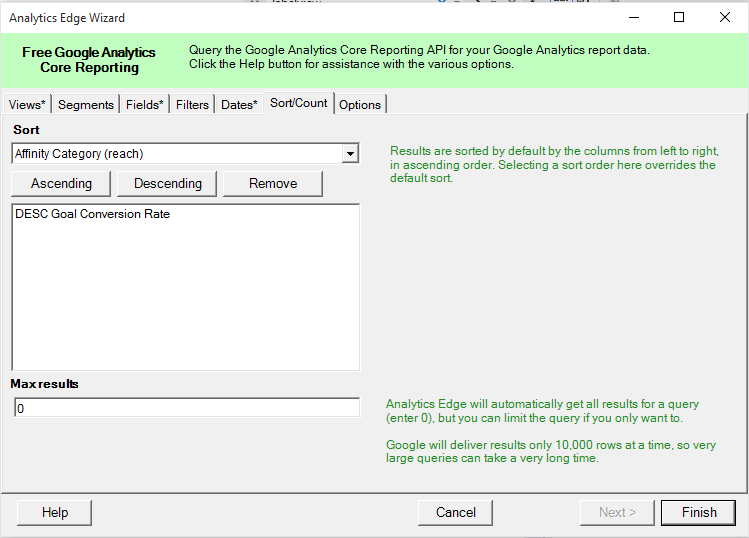 Although Google’s API returns only 10,000 rows per query, Analytics Edge will transparently make multiple queries to get all your results. You can limit the query by entering a number other than zero. This entry was posted in Google Analytics on 2014/03/30 by functions. Copyright 2014-2019 Analytics Edge Inc.